The Delaware watershed’s freshwater mussel populations are a shadow of their former selves, reduced by centuries of dams and water pollution. The perils of water pollution might seem obvious, but dams? It’s not as if mussels can swim. 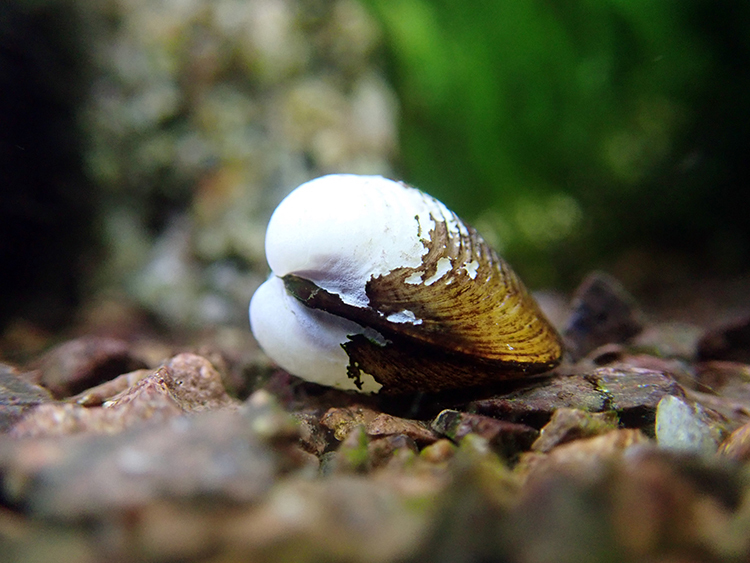 However, as Cheng explained, larval mussels start their lives getting shot out of their mother’s shell and into a fish’s face. “The fish ends up as the mode of transportation. They hitch a ride for a week or two and then drop off.” Without the fish, they’d never be able to land upstream, and the population would gradually get washed away. Block the fish with a dam, and you also strand the mussel larvae. One goal of the hatchery is to produce mussels that can be seeded upstream of dams, thereby circumventing the problem. Perhaps more important, though, is convincing people that these outwardly uncharismatic creatures are worth saving. Mussels spend most of their lives just sitting there, filtering water. They aren’t flashy, and, unlike their saltwater brethren, they aren’t food (for humans) either. They supposedly taste muddy, and you wouldn’t want to eat something that has spent decades accumulating toxic chemicals at the bottom of a river. Moreover, mussels are a major, if humble, element of our national heritage. North America has the highest freshwater mussel diversity in the world, according to the U.S. Fish and Wildlife Service. The Fairmount Water Works Mussel Hatchery is only one step in a growing effort to restore the Delaware watershed and engage the public in our rivers as thriving habitat, not just something to drive over. A coalition—consisting of the Partnership for the Delaware Estuary, Philadelphia Water, Parks and Recreation, Drexel University, the Academy of Natural Sciences of Drexel University, the Independence Seaport Museum, and Bartram’s Garden—has formed the Aquatic Research and Restoration Center (ARRC) to develop projects that mix conservation and public outreach. On the other side of the Schuylkill River from the hatchery, shad are getting a boost with another ARRC initiative. Shad spend most of their time in the ocean but breed in rivers and creeks. Like mussels, their populations crashed over the years as they found their way upstream blocked by dams. “Shad is a big part of our cultural history here in Philadelphia, and there’s been a gap of several generations that haven’t experienced that,” explained Joe Perillo, aquatic biologist with Philadelphia Water. With fishways (a series of connected compartments that allow the returning shad to swim in steps to the top of a dam) and some support from restocking efforts, they have seen their numbers recover a little. A new project at the Fairmount Dam fishway aims to help them along. “We’re taking adult returning shad that are showing up below the dam, and we’re putting a group of males and females inside a 12-foot-round, 4-feet-deep spawning tank.” The shad return to the river once they do what comes naturally, but their fertilized eggs stay behind until they hatch. According to Perillo, this method boasts higher hatch rates and less trauma than the more-popular strip-spawning method (in which eggs and milt are squeezed out of the fish).